Here's the classic toy that started the playtime revolution. 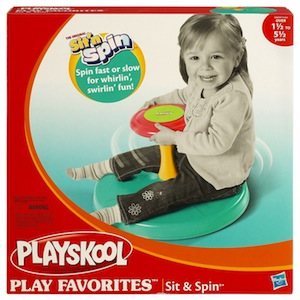 When kids sit on the sturdy base, all they have to do is turn the wheel to set the fun in motion. The whirling and twirling action is all up to them - they can turn slowly for a gentle ride or fast for fun round-and-round excitement. Adult assembly required. Ages 1 ½ years to 5 ½ years.